A significant role for IFNα in the pathogenesis of systemic lupus erythematosus is well supported, and clinical trials of anti-IFNα monoclonal antibodies are in progress in this disease. In other autoimmune diseases characterized by substantial inflammation and tissue destruction, the role of type I interferons is less clear. Gene expression analysis of peripheral blood cells from patients with rheumatoid arthritis and multiple sclerosis demonstrate an interferon signature similar to but less intense than that seen in patients with lupus. In both of those diseases, presence of the interferon signature has been associated with more significant clinical manifestations. At the same time, evidence supports an anti-inflammatory and beneficial role of IFNβ locally in the joints of patients with rheumatoid arthritis and in murine arthritis models, and many patients with multiple sclerosis show a clinical response to recombinant IFNβ. As can also be proposed for type I diabetes mellitus, type I interferon appears to contribute to the development of autoimmunity and disease progression in multiple autoimmune diseases, while maintaining some capacity to control established disease - particularly at local sites of inflammation. Recent studies in both rheumatoid arthritis and multiple sclerosis suggest that quantification of type I interferon activity or target gene expression might be informative in predicting responses to distinct classes of therapeutic agents. The hypothesis that type I interferon plays a central role in the pathogenesis of systemic lupus erythematosus (SLE) has gained growing support in recent years [1–4]. The early data from the 1970 s demonstrating increased functional interferon activity in lupus patient sera have been confirmed and extended using current technologies that permit detection of the broad gene expression program induced by type I interferons [5–8]. Expression of an interferon signature - reflecting expression of often more than 100 type I interferon-inducible genes in peripheral blood mononuclear cells (PBMC) - is also seen in highly related syndromes characterized by systemic autoimmunity, including Sjögren's syndrome . In addition, clinical observations from patients treated with recombinant IFNα for control of hepatitis C infection or malignancy indicate that in some individuals, possibly determined by their harboring genetic susceptibility factors that augment response to interferon, autoantibodies characteristic of SLE can develop [10, 11]. Occasionally clinical features that represent at least four of the American College of Rheumatology classification criteria for diagnosis of SLE develop in those patients. The occurrence of clinical syndromes more characteristic of inflammatory diseases distinct from SLE in patients treated with therapeutic IFNα has gained less attention. Nonetheless, numerous case reports and case series describe inflammatory arthritis, multiple sclerosis (MS) or diabetes that develops during the course of interferon therapy [12–15]. As in the case of the lupus-like syndromes, the capacity of IFNα to promote those diseases that are typically considered to have strong inflammatory components suggests that type I interferon might also play a pathogenic role in diseases such as rheumatoid arthritis (RA), MS or type I diabetes mellitus (DM). The data supporting increased expression of IFNα and interferon-inducible genes in those diseases is less well developed than in the prototype systemic auto-immune disease SLE or in Sjögren's syndrome, which shares some autoantibody specificities and immune system alterations with SLE . Confusing our understanding of the role of type I interferons in these other diseases that are characterized by systemic autoimmunity as well as pathology and clinical manifestations focused on an organ system (RA: diarthodial joints; MS: myelin sheath in the central nervous system; and DM: insulin-producing β cells in the pancreas) is the fact that type I interferons have been postulated to be either potential or current therapies for those diseases based on their anti-inflammatory properties or on clinical experience that suggested some efficacy. The present review will describe data demonstrating activation of the type I interferon pathway in these inflammatory diseases that target specific organs, and will attempt to sort out the relative roles of type I interferons, particularly IFNα and IFNβ, as pathogenic mediators versus attractive therapeutic agents in those diseases. Against the background of extensive data from patients with SLE, and more recently from murine lupus models , that demonstrate an association of interferon pathway activation with more severe disease and disease activity , the common and accepted use of recombinant IFNβ, alone or in combination with ribavirin, in patients with MS presents a conundrum . If type I interferon is broadly pathogenic in systemic autoimmune diseases, why is IFNβ beneficial in patients with MS? A similar question can be asked with regard to RA, where IFNβ has been demonstrated in the synovial membranes of RA patients and in several murine models of inflammatory arthritis but is proposed to be anti-inflammatory and protective rather than pathogenic [20–23]. Possible explanations for these queries include the following: IFNα and IFNβ have distinct properties that confer distinct functional effects on gene expression and the immune system; the pathophysiology of the classic systemic autoimmune diseases is substantially distinct from the pathophysiology of the autoimmune diseases that are characterized by inflammation focused in specific organs; and the complex roles of both IFNα and IFNβ in host defense and immunoregulation allow for each of the interferons to play pathogenic and protective roles, depending on site of production or action, the disease context in which they act, or other factors (Figure. 1). It is likely that each of these explanations accounts in part for the reality that type I interferon does contribute to autoimmune disease pathogenesis but can also control inflammation in some situations. IFNα is predominantly a product of the peripheral immune system. In systemic lupus erythematosus (SLE), IFNα is produced at high levels and has systemic effects on multiple immune system pathways, promoting autoimmunity and inflammation. A more modest level of IFNα might also contribute to autoimmunity in type I diabetes mellitus (DM), multiple sclerosis (MS) and rheumatoid arthritis (RA), as demonstrated by data from murine models and an interferon-inducible gene signature in blood. IFNβ is produced in small amounts by myeloid cells but probably has its greatest impact locally where it is produced by fibroblasts and stromal cells. Type I interferon-inducible gene products, such as IL-10 and IL-1 receptor antagonist (IL-1ra), produced locally can blunt inflammation. The type I interferons are encoded in series on human chromosome 9p. There are 13 functional IFNα genes, one IFNβ gene, one IFNκ gene encoding a protein that is preferentially expressed in skin, one IFNε gene that is expressed in placenta and fetal membranes, and one IFNω gene . All of the protein products of the type I interferon family bind to a single heterodimeric receptor composed of IFNAR1 and IFNAR2. Consideration of a potential pathogenic or protective role for individual type I interferons, particularly IFNα and IFNβ, involves under-standing the cell types that might preferentially produce these interferons, the distinct binding properties of IFNα and IFNβ for the type I interferon receptor (IFNAR), and whether these interferons engage distinct signaling path-ways and activate distinct target genes. While classic teaching holds that IFNβ is most effectively produced by fibroblasts and that IFNα is primarily produced by plasmacytoid dendritic cells, many cell types can in fact produce both interferons, particularly in the setting of a viral stimulus . Differential production of one or another type I interferon in different contexts is probably in part cell-type related but also determined by the location of those cells [21, 23, 26, 27]. IFNβ is produced by synoviocytes and keratinocytes, and in small amounts by monocyte-derived cells. IFNκ, a type I interferon that has attracted less attention than IFNβ and IFNα, is apparently predominantly made by keratinocytes, based on available data . IFNβ-producing cells are located in tissue linings, and IFNβ can also be produced by stromal cells through a novel pathway that involves activation of lymphotoxin-β receptors . In contrast, plasmacytoid dendritic cells are located in peripheral lymphoid organs and, at least in disease settings, in organs affected by inflammation. In view of the widespread distribution and circulating nature of plasmacytoid dendritic cells, situations in which IFNα is produced expose the host to systemic type I interferon and might contribute to autoimmunity, while situations in which IFNβ is produced might result in more localized rather than systemic concentrations of the cytokine and abrogate inflammation. At least one mechanism by which local type I interferon might reduce inflammation has been suggested to be through inhibitory effects on TNF production [30, 31]. The binding properties of each of the IFNα and IFNβ proteins for IFNAR1 can vary, depending on interaction of the cytokine with defined amino acids of the receptor . The availability of signaling components of the Jak-Stat pathway can also impact the functional results of one of the type I interferons binding to its receptor. For example, absence of Tyk2 inhibits IFNα-mediated signaling but does not alter IFNβ-mediated signaling . The downstream gene targets induced by IFNα and IFNβ appear to be highly similar, although some studies have demonstrated that IFNβ is more potent than IFNα in inducing gene expression . Taken together, data comparing properties and functional effects of IFNα and IFNβ would suggest that the most important contributors to differential effects of those two type I interferons relate to the location of production (predominantly local in the case of IFNβ and systemic in the case of IFNα) and to affinity of the interaction of interferon with the receptor and its impact on proximal signaling pathways. Recent studies of gene expression in blood and synovial membranes from RA patients suggest that certain patients may harbor distinct gene expression patterns [35, 36]. Of interest, a pathogen-response gene expression program characterized by increased expression of type I interferon-inducible genes was identified in a subgroup of RA patients who also expressed high circulating anti-cyclic citrullinated peptide antibody levels, the auto-antibodies associated with more destructive RA [35, 36]. A recent demonstration of an association between the interferon signature and progression to arthritis in patients with arthralgias and anti-cyclic citrullinated peptide antibodies further supports a probable pathogenic role for type I interferon in RA, perhaps based on the tendency for systemic type I interferon to promote autoantibody formation . In contrast, the potential relevance of type I interferon, and more specifically IFNβ, produced locally in the joint as a protective factor in RA is suggested by in vitro studies of RA synovial membrane and experiments in murine models of inflammatory arthritis. In collagen-induced and adjuvant arthritis models, intraperitoneal or intraarticular injection of IFNβ resulted in reduction of disease activity and inhibition of cartilage and bone destruction through a significant decrease of TNF and IL-6 expression and an enhancement of IL-10 responses at the site of inflammation [20, 38, 39]. Type I interferon might also positively affect arthritis by inhibiting the differentiation of monocytes into osteoclasts, thereby reducing bone resorption and erosions . Studies of human tissue have indicated that IFNβ is present in RA synovial membranes and reduces synoviocyte proliferation in vitro - observations that have led to the suggestion that IFNβ is an anti-inflammatory mediator with a protective role in RA [21–23]. Administration of recombinant IFNβ in the context of a randomized, double-blind, placebo-controlled clinical trial for treatment of patients with active RA, however, showed no treatment effect with regard to clinical or radiographic scores . Since synovial tissue from the patients who received the IFNβ therapy did not show a significant difference in numbers of infiltrating myeloid cells or T cells compared with the placebo group, it is possible that the dose or timing of IFNβ administration did not deliver sufficient cytokine to the joint to demonstrate an anti-inflammatory effect. As type I interferons, particularly IFNβ, have been associated with anti-inflammatory activities in the setting of RA, and in view of the variable expression of an interferon signature among RA patients [35, 36], we postulated that expression of type I interferon might represent a positive predictor of response to TNF-antagonist therapy in RA patients, while low levels of type I interferon might identify RA patients who would be candidates for alter-native therapeutic options. To investigate this hypothesis, type I interferon activity was determined in plasma samples from a previously described RA cohort  prior to and during the course of TNF-antagonist therapy. We showed that RA patients collectively express increased plasma type I interferon activity relative to levels in healthy controls . The most significant observation, and one that will require confirmation in larger populations, was that higher levels of type I interferon activity prior to therapy with TNF inhibitors are associated with better outcomes as defined by the European League Against Rheumatism (EULAR) RA improvement criteria . In view of the data showing a protective role for IFNβ in murine models of inflammatory arthritis, we looked at which interferon was the major contributor to plasma type I interferon activity in the RA patients. Inhibition experiments using monoclonal anti-IFNα and anti-IFNβ antibodies revealed that both IFNα and IFNβ contribute to type I interferon activity in RA plasma . This observation is in contrast to SLE, where anti-IFNβ antibodies have little effect on plasma type I interferon activity . Moreover, a higher IFNβ/IFNα ratio prior to initiation of TNF inhibitor therapy was found to be associated with a better clinical response, pointing to IFNβ, rather than IFNα, as a key contributor to control of inflammation and predictor for a better response to TNF-antagonist therapy. IFNβ has pleiotropic immunomodulatory actions - including decreased expression of the proinflammatory cytokines IL-1β and TNFα, and enhancement of the anti-inflammatory cytokines IL-1 receptor antagonist, IL-10, and transforming growth factor beta [45–48]. IFNβ has also been shown to mediate inhibition of MHC class II expression on activated PBMC , inhibition of T-cell activation  and decreased expression of adhesion molecules . Since IL-1 receptor antagonist, an anti-inflammatory cytokine, can be induced by IFNβ, we measured IL-1 receptor antagonist levels in RA patient samples. A statistically significant association was detected between baseline IL-1 receptor antagonist levels and therapeutic outcome, pointing to an elevated plasma IL-1 receptor antagonist level as an additional predictor of good response in TNF inhibitor-treated patients . Perhaps consistent with our results, a report from Sekiguchi and colleagues described variability in peripheral blood gene expression of RA patients treated with infliximab. Although not reaching statistical significance, there was a trend toward increased expression of interferon-inducible genes prior to initiation of treatment in those patients who went on to respond to therapy as determined by meeting an American College of Rheumatology 50% improvement response rate at week 22 . Gene expression patterns over time were variable among responders and nonresponders and with time after initiation of therapy, with a typical decrease in interferon-inducible gene expression at the 2-week time point followed by an increase in some patients. A recent report from Van Baarsen and colleagues described data derived from whole-blood, real-time PCR analysis of a panel of interferon-response genes in RA patients treated with infliximab . That group also observed a range of baseline values and changes after initiation of therapy. Rather than comparing patients based on EULAR clinical response criteria, these investigators segregated patients into two groups based on the ratio of their interferon-inducible gene expression scores before and after 1 month of therapy. Those patients who showed an increase in type I interferon-inducible gene expression at 1 month tended to have a poor clinical response to treatment as determined at 16 weeks. Analysis of a subset of their patients identified as EULAR responders or nonresponders supported this trend. This pattern of an increase in interferon pathway activation in TNF antagonist nonresponders is consistent with our earlier study of Sjögren's syndrome patients, in which we observed a general increase in plasma type I interferon activity at 12 weeks after start of therapy in patients treated with etanercept but not in those who received placebo . No conclusion could be reached regarding the relationship of interferon activity to therapeutic response as the etanercept treatment was not efficacious in those patients. Our laboratory is currently conducting studies to determine the distinct gene expression profile induced by plasma from patients who show a clinical response to TNF inhibitors compared with those patients who do not show a good clinical response. Taken together, the available data support a relationship between type I interferon activity or interferon-inducible gene expression and effects of TNF blockade, with at least a trend toward higher levels of type I interferon prior to therapy being associated with a clinical response, and suggest that early incremental increase in interferon-inducible gene expression compared with baseline levels might predict poor response to therapy. While TNF inhibitors have been highly successful in improving clinical outcomes for patients with RA, some patients do not respond. Additional therapeutic approaches have been approved for patients who prove to be TNF inhibitor nonresponders - including treatment with rituximab, the B-cell-depleting monoclonal antibody that targets B-cell CD20. Preliminary data from our collaborators suggest that in contrast to our results showing superior responses to TNF inhibitor therapy in patients with increased plasma type I interferon activity at baseline, those patients who show a superior response to anti-B-cell therapy have low levels of type I interferon at baseline . While it would be clinically useful to have a biomarker that permitted selection of a therapeutic approach that would prove most effective based on measurement of type I interferon levels, it is very likely that the nature of RA, the complexity of the genetic contributors to therapeutic response, and the variability in the complement of mediators produced in each patient will not allow a simple predictive test. Nonetheless, distinct relationships of systemic type I interferon levels in patients who respond to TNF inhibitors compared with those who respond to anti-B-cell therapy should stimulate new concepts regarding mechanisms of disease pathogenesis. The moderate efficacy of recombinant IFNβ in patients with MS suggests the obvious conclusion that type I interferon is therapeutic rather than pathogenic in that disease . It should be noted, however, that the clinical development programs which led to the approval of IFNβ did not define its mechanism of action. Nor has it been clear whether IFNβ offers a benefit different from that seen after administration of IFNα. In fact, the differential effects of IFNα and IFNβ are difficult to demonstrate. In general, the gene expression programs that are induced by IFNα versus IFNβ are largely overlapping . While subtle differences in the binding properties of each of the interferons to IFNAR, their common receptor, have been predicted based on analysis of their amino acid sequence and mutation studies, and there are demonstrated differences in engaging downstream signaling components by the two type I interferon subtypes, their functional impact on gene expression is quite comparable [32–34]. In light of the frequent administration of therapeutic IFNβ, it is perhaps surprising that gene expression analysis of patients with relapsing remitting multiple sclerosis (RRMS) (untreated with IFNβ) has demonstrated an interferon signature similar to the more classic signature seen in many patients with SLE [31, 54, 55]. Van Baarsen and colleagues were among the first to discern the typical signature reflecting type I interferon activation in whole blood in their study of 29 patients with RRMS and 25 healthy controls . Along with a signature of immunoglobulin-related transcripts, one of the most prominent groups of transcripts was enriched in interferon-induced genes. The authors performed several analyses of the differentially expressed genes in their dataset in comparison with genes defined as either type I or type II (IFNγ)-inducible based on data in the literature, and concluded that type I interferon-inducible genes were increased in RRMS patients compared with control subjects whereas type II-induced genes were comparable between the two groups. Van Baarsen and colleagues went further, however, and analyzed the gene program with a view towards predicting whether bacteria - which tend to activate the immune response through NF-κB-activating TLR2 or TLR4 path-ways - or viruses - which tend to activate the immune response through TLR3, TLR7 or TLR9 pathways and utilize MyD88 - are more likely to be responsible for the gene program observed in the patients. The NF-κB program was not different between patients and controls, but the interferon-induced gene program, similar to that induced by viruses, was differentially expressed. The study also compared the pattern of overexpressed genes in the RRMS patients with those induced in macaques by smallpox infection, and found that more than 50% of the patients clustered with the virus-infected macaques. The differentially expressed genes that characterized this subset of RRMS patients corresponded to those that describe a common response pathway characterizing innate immune responses to microbes . A role for type I interferon in RRMS is also supported by demonstration of IFNα, IFNβ, and MxA protein in brain lesions of patients with MS [56–58]. In acute lesions, astrocytes stained positive for IFNβ, macro-phages expressed more IFNα, and endothelial cells some-times expressed both IFNα and IFNβ. Chronic lesions were more likely to be positive for IFNα . MXA, a type I interferon-inducible gene product, is present in astrocytes, in infiltrating T lymphocytes, and in endothelial cells - and the presence of nearby plasmacytoid dendritic cells suggests that the interferon is produced locally [57, 58]. MXA protein in peripheral blood of RRMS patients and elevated serum levels of type I interferon are also detected . Since the assays used to detect type I interferon activity in MS sera are distinct from those that have been used by others to quantify that activity in SLE patients, the relative levels cannot be compared. Based on the requirement for IFNγ priming to detect MxA protein in IFNAR-positive WISH epithelial cells cultured with MS sera, however, it seems probable that the levels are likely to be lower in most MS patients than in SLE patients with detectable interferon activity. One interpretation of the data demonstrating local type I interferon and its induced protein products in MS brain is that the interferon is providing an immunosuppressive effect . The paradigm of IFNα promoting systemic autoimmunity versus IFNβ reducing local inflammatory disease as an approach to understanding the role of type I interferons might apply to patients with MS treated with IFNβ. Consistent with the hypothesis that type I interferon inhibits TNF production are data from a study of RRMS patients treated for 18 to 24 months with IFNβ compared with patients not treated with IFNβ . IL-12, TNF, and IFNγ levels were elevated in the plasma or culture supernatants from MS patients compared with controls, but TNF and IFNγ levels were significantly lower in patients treated with IFNβ compared with those not treated. Of interest, TNF levels in whole blood cultures stimulated with lipopolysaccharide and IFNγ in supernatants of cultures stimulated with myelin basic protein were not different from levels in healthy controls in patients who had been treated with IFNβ, but did increase further in RRMS patients who had not been treated. At least in the case of the TNF data, the results would support an inhibitory effect of IFNβ downstream of TLR4 that reduces target gene expression. A comprehensive analysis of IFNβ responders and nonresponders was recently published . The study analyzed 47 patients with RRMS (29 responders and 18 nonresponders, with responders defined based on no increase in the Expanded Disability Status Sale and no relapses during 2 years of treatment). Comparison of baseline gene expression profiles in PBMC identified differentially expressed genes in the two groups. Of great interest, type I interferon-inducible genes were generally overexpressed in the nonresponder patients and represented the pathway most significantly associated with nonresponse to IFNβ. When assessed after 3 months of therapy, most IFNβ clinical responders showed a robust cellular response with increased expression of interferon-inducible genes, while the nonresponder group showed modest or no increases in levels of expression of those genes. In fact, a prediction algorithm identifying the eight genes that best predicted IFNβ responders from nonresponders included five typical type I interferon-inducible genes (IFIT1, IFIT2, IFIT3, IFI44, and OASL). The conclusions from the study of this initial cohort were validated in a second cohort including 15 responders and 15 nonresponders . Consistent with the increased level of interferon-inducible gene transcripts in the nonresponder group, baseline phosphorylated-STAT1 levels were higher in nonresponder monocytes than in responder monocytes. In addition, type I interferon bioactivity was higher in the nonresponders than in responders or healthy donors. The authors of this highly informative study performed in vitro stimulation experiments to compare signaling downstream of IFNAR as well as in response to TLR ligands, and found roughly comparable responses in the two patient groups - with the exception of production of IFNα in response to lipopolysaccharide, which was significantly lower in responders than in nonresponders or healthy donors, as was expression of IFNAR1. The interpretation of these results suggests a complex role for the type I interferon system in MS: consistent with the Van Baarsen and colleagues study, a subset of RRMS showed a type I interferon signature in blood in the absence of treatment, with Comabella and colleagues showing increased bioactive type I interferon in the nonresponder group - an observation confirmed in a recent report [59, 60]. The Comabella and colleagues study suggests that the high interferon group, those cases that do not respond to IFNβ, has an interferon pathway that is constitutively activated but is not further activated by administration of recombinant IFNβ. As the non-responder group obviously has poorer outcomes than the IFNβ responders, one is led to the speculation that increased production of type I interferon in MS patients contributes to disease and refractoriness to therapy. Similar to mechanisms suggested relevant to SLE, myeloid dendritic cells in the nonresponder RRMS patients studied by Comabella and colleagues showed increased expression of the costimulatory molecule CD86, suggesting that those cells might be capable of effective activation of self-reactive T cells. One interpretation of the different profiles in the IFNβ responders and nonresponders is that when presented with an innate immune stimulus (such as lipopolysaccharide), the responder monocytes engage cellular mechanisms that reduce the capacity of the cells to produce type I interferon while the cells from non-responder patients do not ramp down that pathway. Impaired production of inhibitors of the Jak-STAT pathways activated by interferon binding to IFNAR was not demonstrated by the authors, as SOCS1, SOCS2 and PIAS1 expression was comparable between responders and nonresponders. Taken together, the data draw attention to the regulatory mechanisms that modulate innate immune responses downstream of TLRs, with TLR4 the relevant pathway in the RRMS patients. Consideration of the demonstrated increased type I interferon bioactivity, increased expression of interferon-inducible genes, and stimulatory dendritic cell phenotype in IFNβ-treated patients who do not respond to that treatment raises the possibility that, similar to the situation in SLE, type I interferon might be a pathogenic mediator in that subset of RRMS patients and might be an appropriate therapeutic target. Additional studies that characterize this interesting nonresponder group more completely from the immunologic and serologic parameters will be of great interest. Although autoantibodies are not presumed to play as significant a pathogenic role in MS as T cells, it will be interesting to know whether the interferon high nonresponder group demonstrates higher levels of relevant autoantibodies than the interferon low responder group - as is the case in interferon high SLE patients . The induction of BAFF by IFNβ has been demonstrated in MS as in other diseases and could be a mechanism that contributes to increased humoral immunity. It will also be productive to compare T-cell responses to relevant self-antigens, such as myelin basic protein, in the IFN high group - the prediction being that self-reactive T cells will be expanded or more readily activated by antigen-presenting cells in those patients. The somewhat counterintuitive data presented by Comabella and colleagues leave hanging the issue of how IFNβ results in a beneficial effect in those patients who do respond. One should note there is general agreement that recombinant IFNβ produces only modest responses in some patients. One prediction that could be tested using samples from the published study cohorts is that patients who go on to respond to IFNβ therapy are those with more robust TNF production. While the mechanisms that account for inhibition of TNF by type I interferon are not fully elucidated, the cytokine data do show reduction in TNF in patients who complete 18 to 24 months of IFNβ therapy, many of whom are presumably clinical responders . Augmentation of IL-10 by IFNβ through an IFNγ-dependent pathway might also contribute to amelioration of disease activity . There seem to be three categories of defect that are associated with the IFNβ nonresponder RRMS patients: production of interferon is high; in the setting of the in vivo stimuli that characterize MS, IFNAR1 expression and signaling through TLR4 are not reduced in the nonresponders as they are in the responders; and capacity to further activate transcription of type I interferon-inducible genes is abrogated. The latter alteration might be due to a system in overdrive in which all available transcription factors are engaged; in effect, the patient's immune system is desensitized to further activation by IFNβ. It should be noted that extremely high-level expression of gene transcripts typically associated with inflammatory states, such as CXCL10 and PBEF1, achieves levels that are substantially higher in the responders after 3 months of IFNβ therapy . 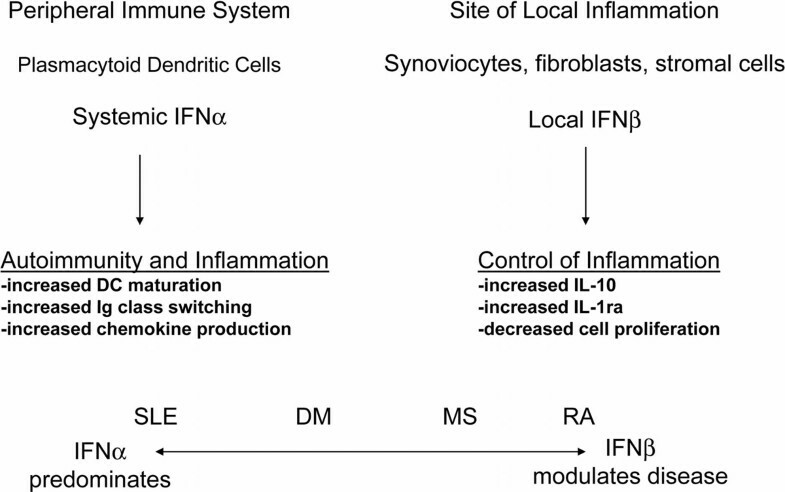 This concurrence of improved clinical activity and increased expression of proinflammatory mediators, at least at the transcript level, indicates that increased proinflammatory gene expression does not necessarily translate into increased inflammation. Perhaps the extremely high expression of IL1RN (IL-1 receptor antagonist) transcripts in the treated responders provides balance that counters the proinflammatory mediators. If RA is an organ-focused systemic autoimmune and inflammatory disease in which local type I interferon is primarily anti-inflammatory, DM is an organ-targeted autoimmune disease in which type I interferon's major role, at least in murine models, is pathogenic. Stewart and colleagues were the first to demonstrate the capacity of IFNα to promote diabetes in a mouse model . They showed increased expression of MHC class II and costimulatory molecules in the pancreas and linked the induction of activated antigen-presenting cells to development of self-reactive T cells. Other investigators have confirmed the disease amplifying role of type I interferon in the nonobese diabetic murine diabetes model [62–64]. While direct data regarding type I interferon expression at the site of disease are limited in patients with DM, diabetes has been induced in those patients who have received therapeutic IFNα for hepatitis C - similar to the reports of development of lupus, inflammatory arthritis or MS . In view of the abundant data from murine models of diabetes demonstrating a probable pathogenic role for type I interferon, along with the induction of diabetes in some patients receiving IFNα, Stewart has suggested that inhibition of IFNα with a specific monoclonal antibody might be beneficial . An opposing view has been proposed by Brod, who has put forward the interesting concept that the three diseases reviewed - RA, MS and DM - represent IFNα deficiency states, perhaps based on inadequate response to an undefined viral infection . In that view, the high level expression of type I interferon and interferon-inducible genes would reflect an active but insufficient effort of the innate immune system to control a more primary inflammatory process. With this idea in mind, Brod has conducted clinical trials in which IFNα is given in oral form to patients, with the hypothesis that the IFNα will generate immunosuppressive alterations in immune function. Brod has demonstrated in a murine model that oral IFNα administration results in increased interferon-inducible gene expression in T lymphocytes . In a study of patients with recent-onset DM, a trend toward preservation of pancreatic β-cell function was observed in those who received 5,000 units of recombinant IFNα by oral route daily, but not in those who received a higher dose, compared with those who received placebo . No effect of treatment was seen in terms of hemoglobin A1c levels. Additional placebo-controlled trials will be required to determine whether oral administration of low-dose IFNα has a therapeutic effect in autoimmune diseases. In contrast to SLE - where a primary pathogenic role for IFNα in autoimmunity and disease pathogenesis is supported by data from studies of genetic polymorphisms that are associated with increased type I interferon, an interferon signature in PBMC, murine lupus studies in which IFNα accelerates disease, and preliminary data from human trials indicating a positive therapeutic response in some patients receiving anti-IFNα monoclonal antibody - the role of IFNα is more complex in the three diseases reviewed. Some of the disease-associated gene variants that have been associated with increased IFNα production in patients with SLE, such as IRF5, Tyk2 or PTPN22, have also shown an association with RA, MS or DM, but the associations are not as well documented in those diseases [69–73]. Data in the literature support a possible pathogenic role for type I interferon in RA, MS and DM, based on demonstration of an interferon signature in blood in RA and MS and based on data from murine models in the case of DM. At the same time, type I interferon appears to play an anti-inflammatory protective role in the joint tissue of patients with RA and in several murine models of inflammatory arthritis. Similarly, some patients with MS demonstrate a beneficial therapeutic effect of IFNβ. Of note, those who show a positive clinical response tend to be those who do not demonstrate an interferon signature prior to therapy and whose PBMC are responsive to type I interferon in vivo. In the case of both RA and MS, while systemic type I interferon might play a contributing role in induction of autoimmunity, its anti-inflammatory role might be more significant. Studies in DM are less well developed, and whether blockade of type I interferon to inhibit expansion of the autoimmune process or administration of type I interferon to reduce destruction of β cells by an inflammatory process or to inhibit replication of a putative virus would be more beneficial will require further investigation. The outstanding collaboration of Dr Clio Mavragani, Dr Dan La, Dr William Stohl and Dr Kyriakos Kirou on studies of the role of type I IFN in RA and SLE is acknowledged. MKC has received a research grant from Novo Nordisk and has had consulting relationships with Biogen-Idec, Bristol Myers Squibb, EMD Merck Serono, Genentech/Roche, Idera, and MedImmune.